The 2018 Book Expo America and Book Con were held May 30-June 3 at the Jacob Javits Center in New York City. A number of stars from film and television made appearances to promote books. The Book Expo is held for the publishing industry, while Book Con is open to fans. One of the highlights was the Expo’s Adult Book & Author Breakfast, hosted by none other than “The Daily Show’s” Trevor Noah. He was joined by a panel consisting of married TV stars Megan Mullally of “Will & Grace” and Nick Offerman of “Parks and Recreation,” as well as popular authors Barbara Kingsolver, Jill Lepore, and Nicholas Sparks. Mullally and Offerman discussed their joint memoir, The Greatest Love Story Ever Told, which tells the story of their epic romance. Noah discussed his upcoming self-titled biography, while Kingsolver, Lepore, and Sparks previewed their upcoming books. Offerman and Mullally later made an appearance on the Downtown Stage to talk more about their book and meet fans. From the world of theater, the creators of the Tony Award-winning Broadway musical “Dear Evan Hansen” were on hand to discuss the new novel based on the show. Other celebrities making appearances at the Expo included D.L. Hughley, Viola Davis, Dave Eggers, Martina McBride, Taye Diggs, Al Roker, Mary Higgins Clark, Amber Tamblyn, and Dr. Ruth Westheimer, among others. 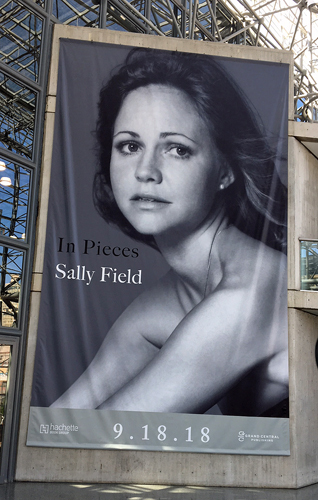 While Sally Field didn’t appear at the Expo, her publisher certainly advertised her upcoming memoir, In Pieces, which will come out in September. There were several political figures on hand as well, including Senator Bernie Sanders, who discussed his new book, Where We Go From Here, and Secretary of State John Kerry regarding his book, Every Day is Extra. Sean Spicer was also there to talk about his upcoming book, The Briefing: Politics, The Press, and The President. Arguably the biggest draws at Book Con were more political figures: President Bill Clinton, who has written a novel with James Patterson called The President is Missing, and Congressman John Lewis, who spoke about his new novel with Andrew Aydin titled Run. Celebrities from film and TV who appeared at Book Con included Taye Diggs, Omar Epps, Nick Tortorella, Brian Selznick, Chuck Palahniuk, and John August. Each year, Book Con gives fans a chance to hear their favorites speak and get books signed. Next articleWhen Will Vegas Casinos Accept Bitcoin as Betting Stakes?